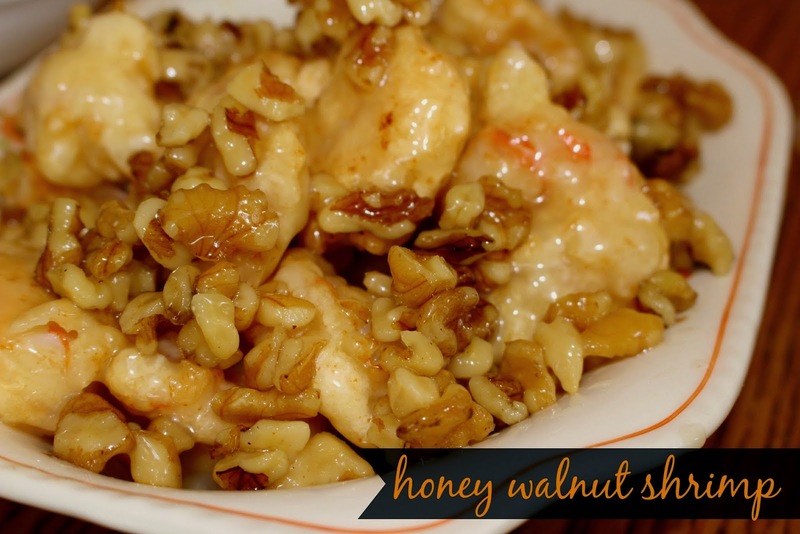 My hub's favorite dish whenever we get Panda Express is their Honey Walnut Shrimp. Every time he gets, as well as doubles it. Not only is there an up-charge because it is shrimp, but we get that twice...since he doubles his entree choice. It isn't a cheap "fast-Chinese-food" experience for us. My choice is always the Orange Chicken...which I have shared my recipe before which you can find here. Anyways. He is always raving about how much he loves this shrimp and how he wants it all the time. Well, I was off for a few days earlier this week and decided to try to make it at home. I had no clue where to start, expect I knew that if it was successful, I will probably be making it many more time. I did a quick search for a suitable recipe to try, nothing seemed to match the battered-fried shrimp with the sweet sauce he craved so much. So I worked my tweeking-magic and combined a few recipes to create my own version. The tweeking was a success. It was a total winner. The hubs loved it and is requesting it again already. Plus, it was easy to throw together. Just plan a little ahead of time. It seems like a lot of steps, but laying everything out before you get started will make it not so over-whelming. Plus, did I mention the candied walnuts are amazing? Recipes adapted from here and here. Bring the 1/4 cup water to a boil. Add the sugar and stir constantly until it becomes a golden color. Add the chopped walnuts into the light caramel, stirring. Reduce the heat and let simmer for 2-3 minutes. Remove from the heat and spread the walnuts out onto waxed or parchment paper to let dry. Separate so they aren't sticking together. Combine the mayonnaise, honey and sweetened condensed milk together in a medium-sized bowl. Heat the oil in a shallow skillet. Meanwhile, in a bowl beat the egg whites until they are foamy. Stir in the flour until it reaches the consistency of paste. Dip the dip into the batter and then place into the hot oil. Let one side cook before flipping to the other. Add the fried shrimp to the bowl with the sauce and toss to coat evenly. Either add the candied walnuts at this time as well, or wait to top after plating the shrimp. Pour the coated shrimp onto a serving plate or bowl.